Home/Interventions, Keywords/What is postcolonial philology? S. Shankar’s most recent book is the just-published novel Ghost in the Tamarind. 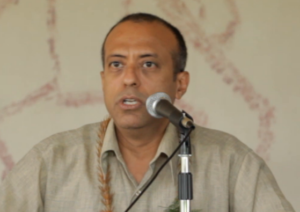 A novelist, cultural critic and translator, he is Professor of English at the University of Hawai`i at Mānoa. His scholarly areas of interest are postcolonial literature (especially of Africa and South Asia), literature of immigration, film, and translation studies. His most recent scholarly books are the co-edited volume Caste and Life Narratives and the monograph Flesh and Fish Blood: Postcolonialism, Translation, and the Vernacular. Shankar is also a translator from Tamil, including of the full-length Tamil play Water! by Komal Swaminathan. He blogs regularly on his website sshankar.net. Postcolonial philology[i] is the name I give to a critical practice. It is what I call the mode of tracing within the context of the modern colonial encounter and its aftermath the movement of words through texts and, more broadly, discourse in general. In the 2017 essay “The Languages of Love: An Essay on Translation and Affect” postcolonial philology allows me to explore a cluster of words to do with love in several languages to reveal commensurabilites and incommensurabilities with regard to affective experience across cultures. In the 2016 essay “Literatures of the World: An Inquiry” it is the critical mode through which I explore the vicissitudes of the literary in the twentieth-century colonial and postcolonial Tamil cultural sphere. And, most directly, postcolonial philology is itself one of the main subjects of the 2016 blog “Pariah and Pundit: Postcolonial Philology and the Caste History of English Words.” My thoughts regarding postcolonial philology have accrued gradually as I have done the research represented in these recent works. Over time, philology as a word has functioned in multiple ways—sometimes taken to indicate simply the study of language (now replaced by linguistics); and at other times a virtual synonym for literary study. Suman Gupta notes that “philology in the broad sense” is “humanistic knowledge formation” (11); he sensibly regards close reading as “grounded in philological scholarship” (13). Typically, philology represents a humanistic approach to texts based on a vigorous appreciation for the historical and social force of language. It has been an important way of interpreting not just modern texts but also the ancient. Staking out a contemporary position in favor of philology, Timothy Brennan avers that it “stands for the labor of learning instead of the rhetorical lure of the latest market pose” (78). Now and in the past, philology carries and has carried about it an air of rigor, sometimes to the point of scholasticism. Despite its scholastic associations, philology has a track record in historically robust thought. Indeed, Gramsci’s commitment to philology within a Marxist context is well known. References to philology are scattered throughout the Prison Notebooks. He wrote: “The experience on which the philosophy of praxis [Marxism] is based cannot be schematized; it is history in all its infinite variety and multiplicity, whose study can give rise to ‘philology’ as a method of scholarship for ascertaining particular facts and to philosophy understood as a general methodology of history” (428). Following Gramsci, then, philology may be regarded as a manner of engaging the written record—and, indeed, discourse as such—in the pursuit of particular facts within a broad context that gives language in its historical and social dimensions special importance. Edward Said, whose contribution to the emergence and growth of postcolonial studies needs no review, was appreciative of philology, recommending a “return” to it in his last (posthumously) published book Humanism and Democratic Criticism. By the philological he meant, “a detailed, patient scrutiny of and a lifelong attentiveness to the words and rhetorics by which language is used by human beings who exist in history: hence the word ‘secular,’ as I use it, as well as the word ‘worldliness.’ Both of these notions allow us to take account not of eternally stable or supernaturally informed values, but rather of the changing bases for humanistic praxis regarding values and human life…” (61). For Said, “worldliness” and “secularism” were lodestars for critical thought. Surely, then, it is significant that he links philology to them so intimately. Within postcolonial studies—that is, within the history and theory of modern European colonialism and its aftermath—, philology becomes a method of the contact zone. If colonialism and its aftermath essentially involve encounters (most often violent) between cultures, postcolonial philology is a way to scrutinize textual and discursive details in the pursuit of an understanding of the history of these encounters. In philology, history (sometimes manifested as etymology) is accompanied by comparison. This conjunction is especially potent for a postcolonial philology. In a historical and comparative guise, postcolonial philology is able to plug gaps in postcolonial studies—for example, to provide critical engagement in a manner rarely done before with the multilingual and vernacular richness that was and is the contact zone of colonialism and its aftermath. As a critical method of the contact zone, postcolonial philology is related to the study of translation, which too is a discursive symptom of the historical encounter between cultures. In brief, postcolonial philology presents a powerful way of plumbing the depths of that dauntingly deep and shifting ocean of historical experience that we call the modern colonial encounter and its aftermath. Thug, a word that I have written about in several pieces, might be used to provide a brief illustration. [ii] As I and others have noted, thug is an English word borrowed in the 1830s from Hindi (or Hindustani) as the British were completing their conquest of India. Because of war and social dislocation, murderous criminal groups were at that time widely prevalent in parts of central, western, and northern India. In Hindi, thug simply meant a deceiver or someone who hoodwinks you. However, in the usage of Orientalist British administrators who were convinced of the essential viciousness of India, the borrowed word soon came to indicate demonic and bloodthirsty Kali worshippers belonging to a secret and ancient cult. As the nineteenth century wore on and the British consolidated their control, the specific associations with human sacrifice and demonic worship mostly disappeared and the word was left to mean what it mainly does now—“a cutthroat, ruffian, rough” (OED Online). Postcolonial philology is the mode through which we might excavate—that is, peel away—the layers of meaning that come to be accreted around thug over nearly two centuries of English usage. Beginning with such contemporary occurrences as in gangsta rap (“the thug life”) and criminological discourse (“soccer thugs”), we might track the word through the life writing, novels, movies and other cultural texts—not only in English but also, for example, in the Italian novels of Emilio Salgari[iii]—that gave shape to the word throughout the nineteenth and twentieth centuries. We might thus pursue it all the way back to the legal testimonies, court documents, purported confessions and administrative manuals of the first half of the nineteenth century, when the word moved from Hindi into English. Rather than an arid academic exercise in etymology and language use, a postcolonial philological exploration of thug in a Gramscian and Saidian mode would illuminate the complex discursive maneuvers of colonial and postcolonial texts around issues of cultural difference, criminality, and law-and-order. Such a postcolonial philology would show how these issues were shaped within as well as came to shape the colonial contact zone—and it would, in an equally significant way, reveal the historical continuities around these issues between the past and the present. Postcolonial philology, then, is a critical mode through which we might function as enterprising archaeologists of colonial and postcolonial discourse. Needless to say, such an exercise is infinitely repeatable—not just with regard to words that move from Hindi or some other Indian language to English but also vice versa; not just with regard to English but also other European languages (for example, French); and not just with regard to India but also other parts of the world that have felt the effect of colonialism. An especially interesting postcolonial philological exercise might be to track the movement of words between two Indian languages or two non-European languages under colonial conditions (to track, for example, the encounter between Tamil and Malay in British Malaya). History, as Gramsci notes, is infinitely variable, and there is no need to think that modern colonialism and its aftermath are anomalous in this regard. Within this infinite variety, postcolonial philology provides a way to recognize some of the shapes of history. [i] Cynthia Franklin and Jesse Knutson read this short piece at short notice and made encouraging and useful suggestions—my thanks to them. [iii] I owe this reference to Francesca Orsini. Saligari wrote about Thugs in the novels The Mystery of the Black Jungle (1887) and Sandokan: The Two Tigers (1904), among other texts. Gupta, Suman. Philology and Global English Studies: Retracings. New York: Palgrave Macmillan, 2015. Said, Edward. Humanism and Democratic Criticism. New York: Columbia UP, 2004. Salgari, Emilio. Sandokan: The Mystery of the Black Jungle. [1887.] Trans. Nico Lorrenzutti. No Place: ROH Press, 2013. Salgari, Emilio. Sandokan: The Two Tigers. [1904.] Trans. Nico Lorrenzutti. No Place: ROH Press, 2010. Shankar, S. “The Languages of Love: An Essay on Translation and Affect.” Comparative Literature 69.1 (2017): 54-73. Shankar, S. “Literatures of the World: An Inquiry.” PMLA 131.5 (2016): 1405-1413. Shankar, S. “Pariah and Pundit: Postcolonial Philology and the Caste History of English Words.” Aug 17, 2017. Shankar, S. Textual Traffic: Colonialism, Modernity, and the Economy of the Text. Albany, NY: SUNY Press, 2001. Shankar. S. “Thugs and Bandits: Life and Law in Colonial and Epicolonial India.” Biography 36.1 (2013): 97-123. Thanks, Arthur Dudney, for the comment. I appreciate that you share the goals of postcolonial philology. Regarding your more substantive comment on “thug”–I accept that I could have been clearer in this short piece that “thug” as deceiver could include murderousness and all round viciousness (including of the kind you cite from the Persian-language dictionary). In lieu of saying more here, I will refer you to what I have written in Textual Traffic and “Thugs and Bandits” in which I acknowledge the possibility that thugs were killers and robbers. I hope this will suffice as clarification. Where I would differ from you is in your assessment of the British discourse and regarding what you call “the main elements.” I don’t believe suffocation and a knock-out drug are the main elements (unless by suffocation is meant strangulation, which is indeed a repeated element). In fact the key element in the British (invented) discourse of thuggee is worship of Kali combined with a number of other ritualistic aspects (like strangulation and the ingestion by thugs of food consecrated to Kali). It is these so-called cultural elements rather than the simple fact of robbery and murder (after all robbery and murder exist and existed everywhere, including in the Britain of the early 19th century) that mark the vicious difference of India (and are repeated from Sleeman all the way down to Masters and Spielberg). Surely a brief dictionary entry is not enough to make large claims, and if you are suggesting that there is more continuity than discontinuity between the British discourse and what came before I would have to disagree with you. The evidence is either too slim to say anything or else counter to the assertions in British discourse.The fact is the British discourse on thuggee was categorically (colonialistically) different than anything that went before–this is why the British were able to see the way clear to decapitating the heads of several executed thugs and transporting them to Europe for scientific study (see footnote in Sleeman referring to Dr. Spry and the head of Buckshee Jemadar). I believe one or more of these heads is now in Edinburgh. I couldn’t agree more with the goals of “postcolonial philology” but I have a quibble with the example of “thug”. It’s not right to say that “In Hindi, thug simply meant a deceiver or someone who hoodwinks you.” Of course, Col Sleeman and other British officers created a whole mythology of thugee, misunderstanding and wildly exaggerating things, but there’s excellent evidence that thugs were seen by Indians as a class apart from other tricksters. I was curious so I checked a Persian-language dictionary of Hindi-Urdu words written in Delhi in 1743, Khan-i Arzu’s Nawadir al-Alfaz, which has an entry for “thug” (pp 164-5, 1951 ed). It explicitly says that a thug is a robber who gives a knock-out drug [daru-yi behoshi] to a traveller and then suffocates him. That’s nearly a century before the British become interested in thugee and has the main elements.